The Arc of Cumberland County was established in 1975 and currently has about 200 members. The organization was previously known locally and nationally for many years as the Association for Retarded Citizens. In 1991, the name was changed to “The Arc” because members, chapter leaders, young parents and people with mental retardation, had become increasingly uncomfortable over careless, inappropriate and too frequent use of the label “retarded”. The new name also allows the organization to serve related developmental disabilities and disorders. 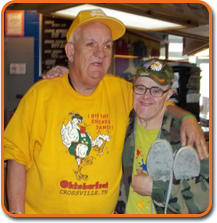 In 2006 the Board of Directors of the Arc of Tennessee unanimously approved eliminating the term “mental retardation” from all of its materials and using the preferred term “intellectual and developmental disabilities”. We have revised our bylaws and brochures to reflect this change. Arc is the nations largest volunteer organization solely devoted to improving the lives of all children and adults with intellectual and developmental disabilities and related disabilities and their families. The Arc works to provide more than 7.2 million Americans having intellectual and developmental disabilities, and related disabilities, with services including employment, training, education, independent living and other opportunities to reach their greatest level of personal fulfillment and potential. The Arc also exists because people with disabilities need help to insure that their rights as citizens of this country are protected. The association also fosters research and education regarding the prevention of disabilities in infants and young children.